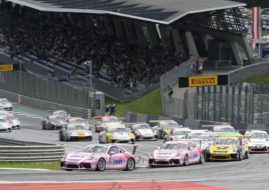 The second day of the Red Bull Ring Porsche Carrera Cup event is reserved for the morning qualifying session and the first race of the weekend which is scheduled for the afternoon. The second race is going to be held tomorrow. At yesterday’s practice session, Phillip Eng was the fastest on his home track proving that he is a favourite for clinching the event title, not just because he is on his home turf but because more importantly because he is a dominant driver in this season. So, it wasn’t much of a surprise that he managed to score the best time at this morning’s qualifying session, improving his result from qualifying by almost half a second. Eng’s time was 1:32.062 seconds, only a few hundredths of a second ahead of Michael Ammermuller‘s time and Sven Muller‘s time. As always in Carrera Cup championships, the competition is of a very high level and the 13 drivers had results within 1:32 seconds of each other in today’s qualifying session. For full results click HERE and stay tuned for race coverage this afternoon.